When he was 16 years old, his mother put a book called Beat the Dealer in his Christmas stocking. He soon went to Las Vegas and began a career as a professional card player – and still calls this the “only real job I’ve ever had.” Years later, he took time off to walk across the country for peace, and fell in with a bad crowd – musicians and peaceniks. In 1996, inspired by his work with a traveling band of musical activists, he began to tour nationally as a solo singer-songwriter. In 2005, he moved to Nederland and stopped performing in public, although he did continue to co-captain the Second Strings Project, which has delivered over twenty thousand sets of guitar strings to folks who need them all around the world. In 2009, he was inducted into the Blackjack Hall of Fame, one of 17 members, including Ed Thorp, the man who wrote the book that his mother put into his Christmas way back when. 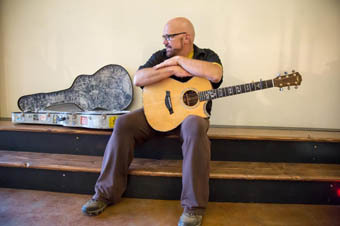 The point is, Darryl draws on a unique set of experiences to craft his exquisite songs, and you’ll want to hear the result tonight at the Freight!